Home › Nieuws & Artikels › Duif & Spel › Ever wanted your pigeon to tell you where it’s been? Well now you can! Ever wanted your pigeon to tell you where it’s been? Well now you can! How many times have you asked your bird when it landed, “where have you been?” Did it not leave the race point, did it turn back at the sight of water, or did it go down for a drink of water and get delayed for an hour? Did the bird detour or make a dog-leg round from where the winning pigeons come from? If only we knew the route the bird took or why it was so far behind the winners that it went off its line of flight. These questions have probably been asked at some point or another by fanciers across the world. Wouldn’t it be great if we could find this out? Does the technology now exist that can answer some of these questions? Kevin Murphy, Director of Learning & Teaching at Angus College in Arbroath, Scotland certainly thinks so. The group at Angus College hopes to develop a live GPS tracking device that can monitor the birds in flight live over the internet using Google Earth. 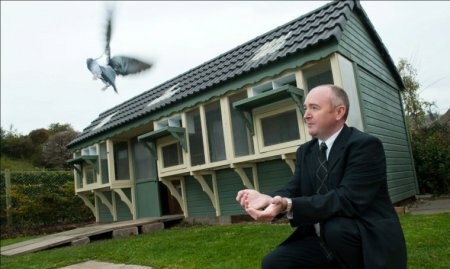 The research project will use a team of racing pigeons based at the college and monitor, over a 3 year period, the route the birds take to return home, observing them by the use of a GPS/GSM module attached to the bird that will show the birds’ route home live on a PC screen. 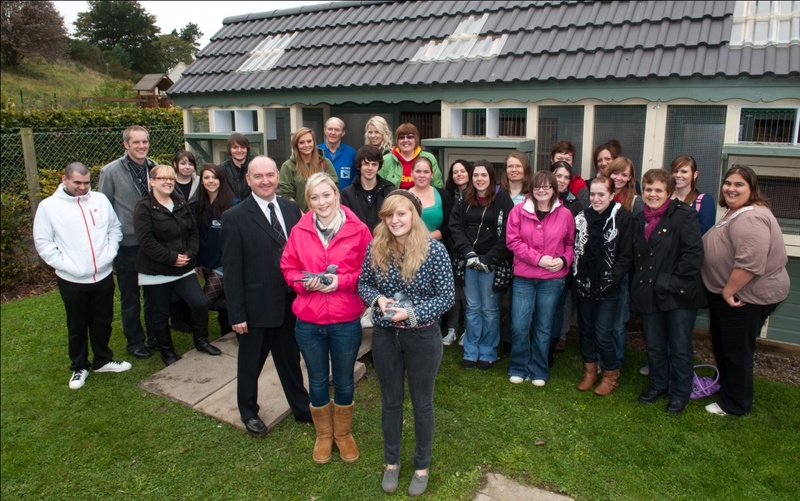 With the help of local students studying a range of college courses in Animal Care, Information technology, maths and other related topics, they hope to research some of the key things that impacts on the homing ability of the racing pigeon and determine why the bird went off its line of flight. As you will be aware, the number of losses occurring each year in the pigeon sport is showing no signs of improvement and whenever you speak to pigeon fanciers it’s the same old story; high losses in young birds and very few fanciers that are able to build an established team of 3, 4 and 5 year old experienced birds. While it is appreciated that birds of prey and other factors must be taken into account, there is always one question that lingers: where do these pigeons go? Why, in a seemingly perfect flying day, are the returns not 100 per cent? Kevin has discussed with a design company a prototype device that would be fitted to the birds, either clipped onto its leg or to its back. The device will be GSM and GPS module controlled and gives off a signal every 5 minutes to determine the bird’s location with an accuracy of 10-15 metres; the device has a battery life of 72 hours. From this we will be able to monitor the birds’ flight direction and establish over a 72 hour period where the birds go to if they get lost. Collate scientific data from weather stations, Solar Influences Data Analysis Centre (SIDC) and Solar & Geophysical Activity Forecasts to determine if naturally occurring events (solar flares, K factor etc) impact on the birds’ homing ability. Monitor the flight of both inexperienced and experienced birds over distances up to 300 miles. Determine if the birds improve their line of flight by repeated liberations from set locations. As the birds will be required to fly across stretches of water (both the Tay and Forth estuaries in Scotland), the direction of flight will be monitored to see if the birds cross the water directly or find the shortest/easiest way across. Monitor over a 3 year project period the developments of the birds and how they improve with age. Do birds that have developed as a ‘leader’ as a young bird continually improve and do they become the birds that determine the line of flight, pace of the race etc? Some birds break from a batch and make it home first – is it possible to determine this and to identify the leading birds? The use of the GSM/GPS device will allow us to test individual birds. Try to establish why birds get lost and where they go to. As the device will be activate for up to 72 hours we can determine how far off the line of flight the bird went. E.g. If a bird becomes dehydrated and goes down for a drink we will be able to pin point the location and to determine how long the bird was inactive and how long it took to return home. While some birds will be fitted with a GSM and GPS tracker, some will be fitted with micro-cameras to photograph the line of flight and to evidence what happens to birds in flight. This project is also about raising the awareness of pigeon racing and involving students at the local college where various student groups will participate in the project and use this as a real life project to enhance their own educational studies. Like everything else a project like this costs money. But Kevin is hopeful of raising the funds through either direct sponsorship or from fancier donations. A one loft race with this year’s youngsters aims to offer a £250 prize for an entry cost of £50 sponsorship per bird. 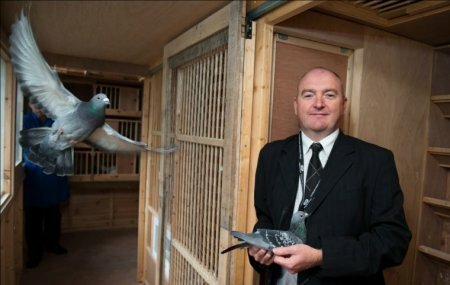 Elimar have also offered to host a pigeon sale where Kevin hopes to attract young birds from National or International winners with a view of any monies raised going directly into the pigeon tracking project fund. If you would like your bird to tell you where it’s been and the reason it was late, then maybe you would like to help. Kevin can be contacted on Kevin.murphy@angus.ac.uk or 01241 432669 or at Angus College, Keptie Road, Arbroath Scotland DD11 3EA. Thank you to all the people who have emailed me from places far and wide such as South Africa, Denmark, Belgium and Bangladesh etc showing interest in the project. To answer some points - I have discussed this with a developer and the weight will be approx 14.2 grams, but like everything else we need to raise the funds for this ... Approx £28,000. As a reminder if anyone (as an individual or company) and wishes to sponsor this project please get in touch. Thanks Kevin. How's your project with gps on pigeons?